The risorgimento is the name given to the 19th-century movement in Italy to unite the entire Italian peninsula into a single nation. The term covers philosophy, politics, social unrest and military events in Italy from the early 1800s through the last of the wars of unification, including Italian participation in WWI, which added Trieste and Trento to the nation. The most striking military episode was Garibaldi’s (image, left) conquest of the South, the Kingdom of the Two Sicilies in 1860, an event that led to the proclamation of the Kingdom of Italy in 1861. Psychologically, however, Italy was not really unified until her “natural” capital, Rome, was restored, which took place in September, 1870. The word risorgimento, itself, means “resurgence” and was the name of Cavour’s newspaper (Camillo Benso, Count of Cavour, 1810–1861, the first prime minister of Italy) first published in November, 1847. The paper aimed to “reform the economic conditions in Italy” and work for Italian “independence” and for “social and economic cooperation” among the various Italian states in existence at the time. There is a certain inevitability in the word risorgimento. In the words of Mazzini, the philosopher of the risorgimento, similar ‘language, custom, tendencies and capacity’ are the elements that produce a unified national culture. The standard canon passed down to generations of Italian school children is, thus, that the risorgimento was a noble and successful movement to produce that national culture. The other side of the story, the anti-Risorgimento, is not widely known nor transmitted as part of the canonical version of the unification of the nation. The great Austrian diplomat, Metternich, referred to “Italy” as “little more than a geographical expression.” Even Massimo d’Azeglio’s famous line (uttered in the 1860’s after the Kingdom of Italy had been proclaimed)—“We have made Italy; now we have to make Italians”—can be seen as a concession that the similarities of northern and southern "language, custom, tendencies and capacity" might be profoundly tricky to work with. They were —and still are. Who was against the unification of Italy? Obviously, the Kingdom of Two Sicilies, with its capital at Naples. It is true that King Ferdinand II of Naples sent troops to help the Savoy Kingdom of Piedmont and Sardinia against Austria in 1848 (in what is called the First War of Independence), but he had second thoughts and recalled them, leaving the northern armies to go it along and lose. Ferdinand probably changed his mind because of the presence of another great and powerful anti-Risorgimento party, the Vatican States. In those days, that did not mean a tiny bit of land with a nice church (ok, it’s more than nice) on the banks of the Tiber. It meant most of central Italy. The Vatican States were a thousand-year-old powerful nation, had fielded armies in the past and, later, carried on modern diplomacy. The head of state, the Pope, could make or break kings and emperors and often did. This was “the temporal power of the church,” a power that Ferdinand was unwilling to confront; he would not help bring about the end of that “temporal power,” which was necessary if Italy was to be united. Obviously, the Vatican, itself, was against any movement that might lead to its demise as a powerful state, as were the Catholic nations, Spain and France. To all of these parties, the Risorgimento was not at all a high-minded attempt to create cultural unity, but a gigantic land-grab by the Savoy Kingdom of Piedmont and Sardinia. To them, the new Kingdom of Italy was simply the result of an invasion by a usurping power, as illegitimate as Napoleon had been. Thus, for a number of years in the 1860s, until the annexation of Rome, itself, to the nation, there was a strong anti-Risorgimento "legitimist" movement centered in Rome, where the Pope was king and where the ex-Bourbon court of Naples still conducted a government in exile, waiting to be restored. Much of the 1860s in Italy was taken up with the task of combating “banditry” (or brigandage) in the south in order to solidify the unity of the nation. That is the version handed down to generations of Italians, but the decade remains obscure in the minds of many. Since one man’s “bandit” is another man’s “resistance fighter,” it’s a good idea to know just what “bandit” meant in late 19th-century Italy. First of all, there have always been real bandits in the south, bands of roving criminals who lived outside the law. Whether they were Robin Hoods resisting an evil king or simply evil bastards who liked to rob and kill is irrelevant. They have always existed and, indeed, for centuries have often sold themselves to the highest bidder in one war or another. But “combating bandits in the south in order to solidify the unity of the nation” didn't mean those people; it meant anyone who resisted the unity of the new nation. Who were they? For one, the exiled Bourbons. After capitulation at the siege of Gaeta in February 1861, the king and queen, many in the government as well as a number of officers and soldiers in the Bourbon army went to Rome where they lived as guests of the Pope. 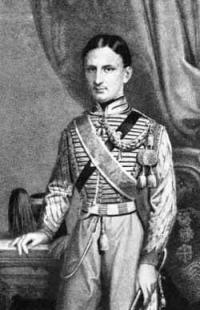 (The ex-king of Naples, Francis II, disbanded his government-in-exile in 1867.) [See these entries: (1) and (2) on the presence of the Bourbon royal family in Rome.] Then, there was the large body of peasants in the south, those who had welcomed Garibaldi as an egalitarian revolutionary and who looked forward to an end of the last absolute monarchy in Europe as well as the end of the almost feudal agrarian system where the absentee elite owned the land and peasants worked it for them. Garibaldi handed over his conquests (all of southern Italy) to the king, Victor Emanuel II of Piedmont and Sardinia, and went home, no doubt thinking that political rulers of the new Italy would keep his egalitarian promises for him. (Garibaldi was a superb commander of men on the field of battle, but all he knew of politics was that he was pretty sure it started with the letter “P”.) Then, you had the real bandits, many of whom had fought for Garibaldi and who now hoped for commissions in the new Italian National Guard. None of that happened, and, thus, you had an angry population, disappointed with the outcome of the revolution, encouraged by Bourbons in exile, themselves bolstered by the wishful thinking of the Vatican and Catholic nations of Europe that the new Italy would not last. In modern times, there has grown up in the south a “bandit romanticism,” telling the untold story, as it were, of the Robin Hoods who fought the good fight against the northern invaders and lost. A film, Li chiamarono banditi [They Called Them Bandits], a 1999 film directed by Pasquale Squitieri, is a good example. (The scene in the image from the film, above, is of a mass execution of villagers in reprisal for their having helped bandits.) It is based on the life of the very real bandit, Carmine Crocco. He started out in the Bourbon army, left it and joined the forces of Garibaldi, then became the most successful of the disappointed bandit resisters to the new Italy, at times leading an army of 2000 and occasionally defeating the Italian regular army in pitched battle. 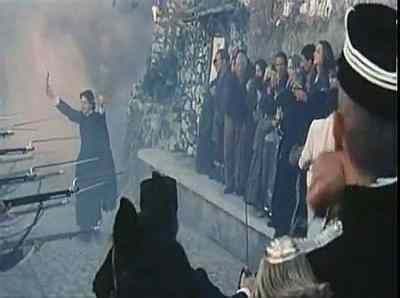 In the film, he dies gloriously in the open field against the Piemontese invaders. In real life, he was captured, sentenced to death, had the sentence commuted to life, and died in prison in 1905. He left an auto-biography, Come divenni brigante [How I became a Bandit]. In any event, after the dissolution of the Bourbon government-in-exile and after Rome became the capital of the new Italy, the cause was lost, national unity was secure, and “bandits” joined the obscure footnotes of history. -"Brigandage: The Brigands of South Italy." New York Times, October 16, 1868. - Davis, John A. Conflict and Control: Law and Order in Nineteenth-Century Italy, London, Macmillan. 1988. - Dickie, John. A World at War: The Italian Army and Brigandage 1860-1870. History Workshop, No. 33 (Spring, 1992), pp. 1-24, Oxford University Press. - Leeds, Christopher. The Unification of Italy. Wayland Press, Brown University, Providence, RI. 1974.